I never write reviews, but the service we received was really so wonderful and this company is such breath of fresh air, i really want to share my experience. First of all my phone call was picked up on a second ring, they sent someone to give me a quote within 3 hours! I was able too book them for following day, and could’t be happier with the service. I have 3 children and 2 german shepards,needles to say i need help. In 5 hours that the girls was here, my house was transformed, even the grime on the patio doors, that we couldn’t do anything about in years,was gone! once they were done, they came to ask me to walk thru to make sure i was satisfied! Needles to say, Spotless is in my house twice a month now, and makes my life so much easier! Great, fast, reliable service with a smile. They come once a week to clean my condo, and let me tell you, it’s a pleasure to come to a wonderfully smelling, spick and span home. I advise you to try Spotless Cleaning Services and see for yourself! Thank you! I used Spotless services today for the first time today, and I couldn’t be more impressed. Not only they did everything I asked for fast and very thorough, but once they left I found all the extra little things they did, including my messy balcony was organized and mopped! Thank You Spotless for a great service! Daiva and Spotless Cleaning are awesome! We do not live in Miami full time and so it’s very important to us to have someone reliable and trustworthy–not only to take care of the cleaning — but to know we can call on for any unforeseen problems that arise. Daiva is responsive and helpful–from meeting contractors for us and supervising installations, to accepting deliveries for us and even starting the car periodically so the battery doesn’t die–we trust Daiva and her company to look after our place like her own and we have not been disappointed! Your team of specialists will always be my choice for cleaning my home. Boy, does my family and I breathe so much better! How I love coming to my office even more! Every section feels new again! 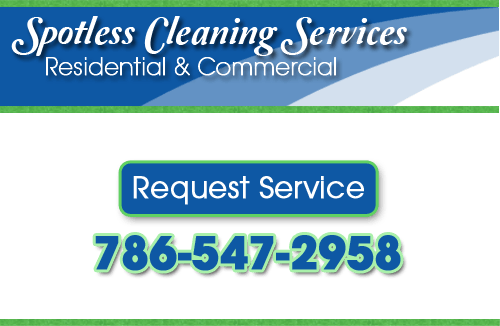 When you’re looking for a professional, Miami cleaning company, call Spotless Cleaning Services at 786-547-2958, or complete our online request form.